I'm really proud of my Mother-in-Law, Lori. She has the heart of gold, and has a new idea up her sleeve every time we turn around. She always says: "You just have to keep on re-inventing yourself". I agree. She came up with a terrific idea to make and sell these adorable Grinch Trees in her Flower Shop in Lillooet, British Columbia. Although I know they are popular in other parts of the world, she is the first to bring them to her area... and they are FLYING out the door. Last we talked, she said they had 40 pre-sold! (meaning: People from the community have been pre-ordering them without actually seeing what they were going to look like). She told me they take about 30 minutes EACH to make. UNREAL. I think the true clincher is, she's not actually making much money off of these trees. As we all know, materials and staffing are the two big money takers in any retail situation .. so on top of not making much of a profit per tree, she is giving $5.00 of every sale to the Lillooet Food Bank. 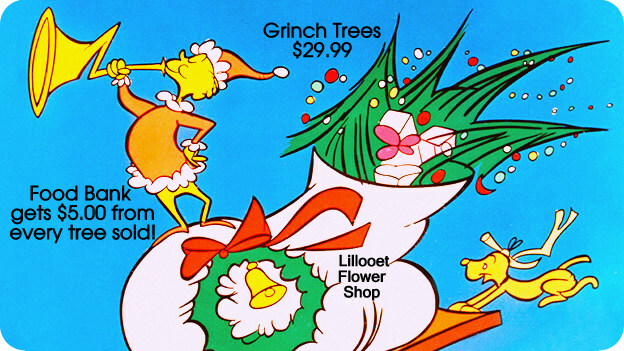 It's a true labour of love these Grinch Trees... One more notable thing...Lillooet Foods has partnered with the Lillooet Flower Shop in taking the money donated and turning it around, allowing the Food Bank to pick and choose what they need most during the Christmas Season. They even have a few Grinch Trees they are selling in store. Keeping business local is one HUGE priority on my mom's list. She always is reaching out to other business owners in partnerships, donations, and looking for ways to build community. So, here is to a wonderful Christmas Season... for all those down in Whoville... and Lillooet. Merry Christmas!